Self injury (including suicide) is the 8th leading cause of death in this country. It is time to do something about it. 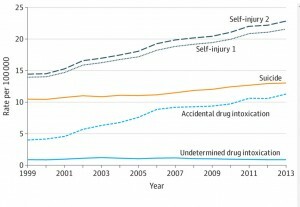 An article just published online in the prestigious journal JAMA Psychiatry makes us drawn case that our fascination with trying to come up with clear answers to questions that may ultimately be impossible to answer (what a person’s intent was when they injured themselves) is obscuring the fact that self-injury is now the eighth leading cause of death in this country. 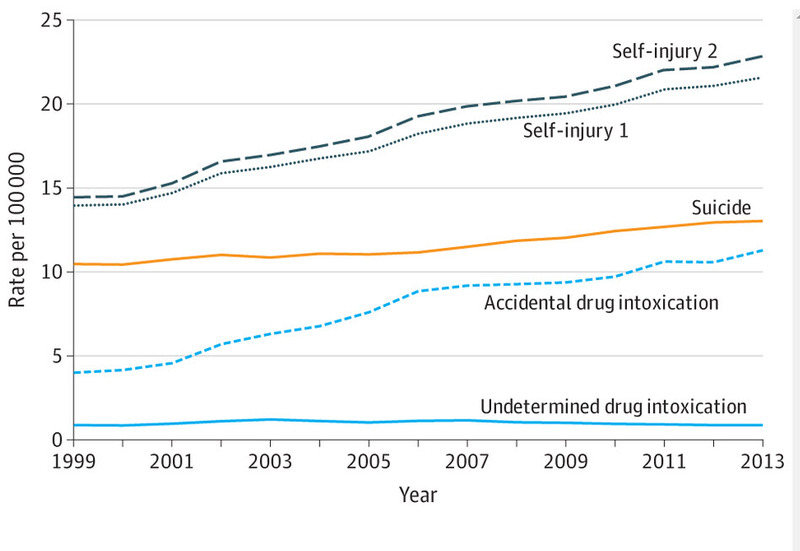 Take a look at the slide to the left and you’ll see how the fact that we divide drug intoxications into intentional and accidental has tended to obscure and nearly 80% increase in deaths from self-injury during the last 14 years. The fact of the matter is, even in cases where drug intoxication does not lead to death and, therefore, it is possible to collect detailed information from the person as well as family members, it is frequently impossible to figure out whether the person had in mind, in the last few minutes before the intoxication, committing suicide. The authors refer to a recent in-depth evaluation of all suicide deaths that took place in England which suggests strongly that coroners are increasingly likely to contribute drug intoxication deaths to “accidental” ingestion rather than suicide. They also note that it is nearly impossible to distinguish the risks of future suicide in those who survive accidental versus intentional drug intoxications, in other words the two groups appear identical in risk factors. Rockett IH, Caine ED. Self-injury Is the Eighth Leading Cause of Death in the United States: It Is Time to Pay Attention. JAMA Psychiatry. Published online September 16, 2015. doi:10.1001/jamapsychiatry.2015.1418. Gunnell D, Bennewith O, Simkin S, et al. Time trends in coroners’ use of different verdicts for possible suicides and their impact on officially reported incidence of suicide in England: 1990-2005. Psychol Med. 2013;43(7):1415-1422.